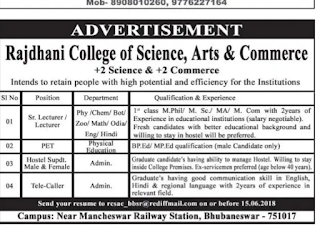 Rajdhani College of Science, Arts&Commerce, Bhubaneswar,has advertised in THE Samaja newspaper for recruitment of LECTURER jobs vacancies. 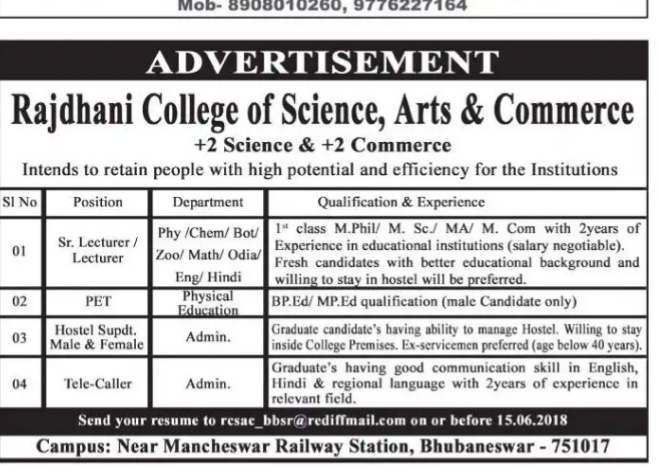 Interested and eligible job aspirants are requested to apply on or before 15.06.2018.Check out further more details below. About College: Our college seeks to uphold and foster the values of spirit of inquiry, pursuit of excellence and humanism among its students drawn from the broadest cross section of society reflecting the institutional goals of equity, access and justice under the guidance of its dedicated band of faculty in an environment congenial for experiment, innovation and progress. How to Apply: Interested candidates may send their CV through mail id on or before 15.06.2018.